Working on a budget, but want one quality jacket to do pretty much everything? Normally I would say something sarcastic and tell you it doesn’t exist. But Alpinestars just made me put my foot in my mouth. With both the Amok Air and Santa Fe Air Drystar jackets, you can have your cake and eat it too. Not only that, you can look like a cross-country touring rider or a rad sportbiker, it’s up to you! The Alpinestars Santa Fe Air Jacket is a touring styled ¾ jacket with large mesh panels for airflow, and handy waterproof and thermal liners underneath for comfort and protection from the rain. An internal waterproof pocket can protect any particularly valuable valuables you have on your person. With multiple fit and volume adjusters, finding the proper fit with your liners in or out won’t be a problem. Bio Air CE certified armor will make sure your bones don’t get to know the asphalt very well, and optional chest and back armor will keep you safe there as well. And if you’re a thirsty bugger, there’s an opening on the back of the jacket for a hydration pouch to travel through. Last but not least, the obligatory cargo pockets on the front round the Santa Fe Air out and solidify its adventure touring reputation. 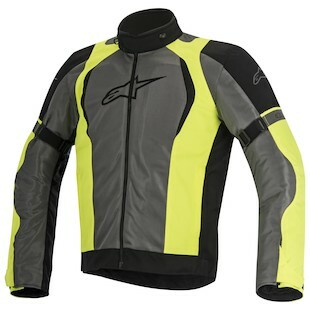 For the racers among you, Alpinestars also has the Amok Air Drystar. A short-cut race jacket with all the comfort and touring accoutrement you can think of. Huge swathes of mesh on the front mean summer will be no problem, with thermal and waterproof liners on the inside fighting the cold and rain on your behalf. Accordion stretch panels mean the fit will be snug and technical, all without sacrificing comfort. 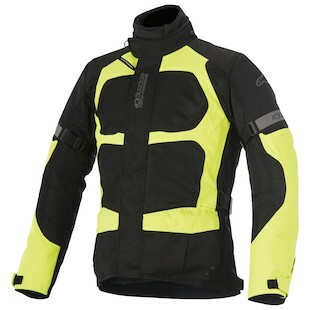 The Alpinestars Amok Air Jacket has the same Bio Air CE armor in the shoulder and elbows, with a chest and back protector optional. The Europeans haven’t always been on top of the game when it comes to multi season touring. If you ride all day everyday and wanted something high quality, your only choice was to spend upwards of $1500 for a fancy Nordic jumpsuit. Now, your favorite Italians have come up with a solution that won’t completely destroy your bank account. It looks damn good, too!